Date: Dec 8 2018, 7 a.m. - 11 a.m. Learn the history that WAAF holds in regards to the attack on Pearl Harbor 77 years ago. 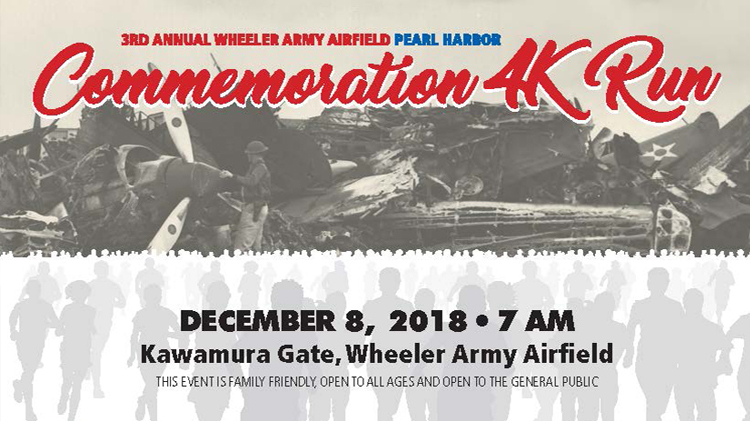 • Participants will enjoy 10 short history lessons spread throughout the route, all in remembrance of the 1941 attack on Pearl Harbor. • Participants will be able to run the flight line and witness the historic hangars from an angle not often visible to the public. OPEN TO the general public, DOD Cardholders and sponsored guests of all ages. Children 12 & under must be accompanied by a guardian at all times. Stollers are permitted. No pets allowed. The first 300 runners to register will receive a Commemorative Pearl Harbor Anniversary coin!